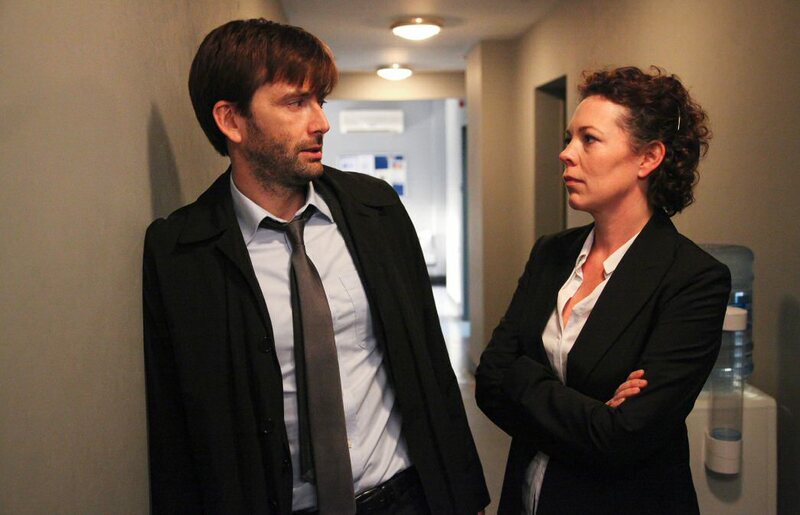 The final episode of BROADCHURCH began with Detective Inspector Alec Hardy getting his walking papers and literally walking away — but he also got his man, collaring Danny’s killer on his last day on the job. True, the murderer wanted to get caught, but Alec had his suspicions and would have got him even without Danny’s cell phone. The best thing I can say about the BROADCHURCH finale is that lived up to it promise; the series got the ending it deserved. And, as the recently concluded DEXTER proved, that’s no easy feat. 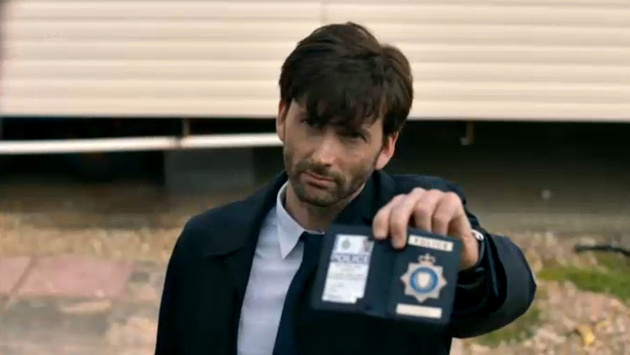 It’s the penultimate episode of BROADCHURCH, and the dominoes are beginning to fall — not only in the Danny Latimer murder case specifically, but also the pieces of the puzzles behind some characters have come together, including Detective Inspector Alec Hardy’s Sandbrook misadventure and Susan Wright’s mysterious past (and reason for the name change). But there are still several key pieces missing, and I expect next week’s finale to be a pretty jam-packed episode. As suspects like Susan are eliminated, others become more likely. But I’m still holding out for a less-usual suspect. I’m not buying Nigel as the killer; I would be more satisfied if Steve were the perp and he got himself caught by insisting on interfering in the investigation. But my pet theory pointing to Ellie’s husband got a big boost this week. 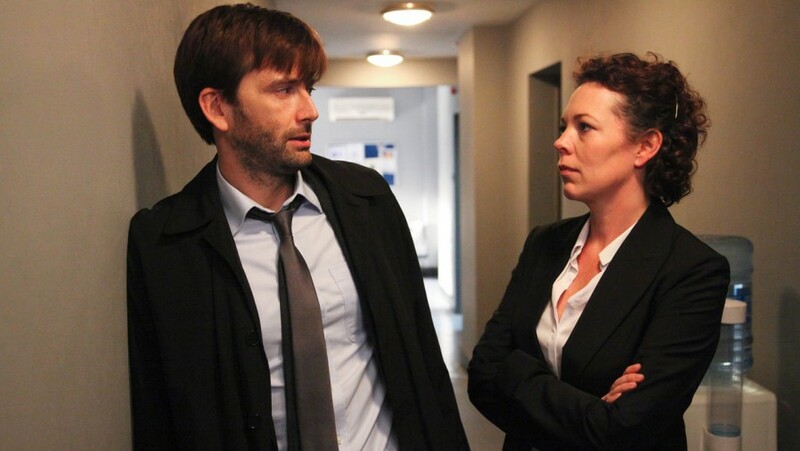 Time has passed in this episode of BROADCHURCH and, ironically just as some are questioning the investigation dragging on, a sense of momentum suddenly began to build in the story’s second half. Clues have finally started to pay off, forensics results are coming in, and the killer may have been prompted to make a hasty, ill-advised move. The spotlight of suspicion has shifted firmly toward Susan and Paul, but why is Tom acting so strangely — and is Ellie being paranoid, or is Joe acting more and more suspiciously? This week she uncovered a possibly significant lie about her husband’s relationship with Tom, Mark and Danny. After (apparently) clearing Mark last week, BROADCHURCH this week demonized a handful of other townsfolk so viewers would have new character to boo. The script tried very hard to make viewers think that creepy old Jack Marshall is the killer. Or could it be prickly Susan Wright, the most off-putting and snide character on the show? And then there’s Paul, the insomniac minister who wanders in the night. What about Steve, the so-called psychic looking to cash in on Danny’s murder? And why were so many people having Sunday dinner together? The most intense, emotionally devastating scene in this week’s BROADCHURCH involved a box of cereal and a grieving mother — and it was almost enough to bring a viewer to tears. The investigation into the murder of 11-year-old Danny Latimer lurched forward this week when police discovered 500 pounds hidden in Danny’s room and cocaine secreted in Chloe’s (Charlotte Beaumont) room. Another forensics team determined via bloody fingerprint that Danny was killed at a shack a couple of miles down the road — and a print from his father, Mark (Andrew Buchan) was also found at the scene. What’s more, CCTV footage from the shack’s car park showed Mark lurking about on the night of the murder. Chloe said she didn’t know anything about the money in her brother’s room, but she got the coke from hotelier Becca (Simone Macaully) — who claimed she got it from Chloe for some guests, but when they checked out before she could pass it along, she returned the coke to Chloe. She got it from her shady boyfriend, Dean (Jacob Anderson). I quite enjoyed last night’s premiere of BROADCHURCH on BBC America, but I definitely didn’t see anything that was very “new” or “groundbreaking” — which is the way the series is being sold. BROADCHURCH is a police procedural about the murder of an 11-year-old boy in a British seaside town, and how the killing affects everyone in town. 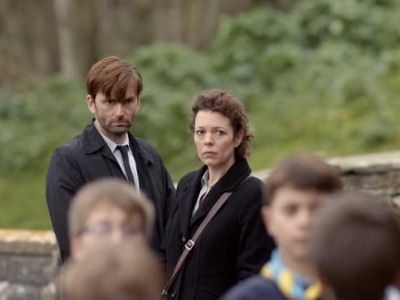 Perhaps its storytelling is new for a series in the UK, but BROADCHURCH reminded me instantly of TWIN PEAKS, but without the supernatural elements: the death of a child shakes a small town to its core. I expect future installments to reveal the dead boy Danny was involved in a secret conspiracy that affects a lot of adults in town and reaches into the local school — just like Laura Palmer’s situation. It’s even mimicking the law-enforcement dynamic: the local cop who knows everyone in town teamed with the eccentric “expert” from somewhere else.